An important part of communicating in any language is being able to specify who is doing an action. In many romance languages, subject pronouns are optional and verb endings indicate the subject. 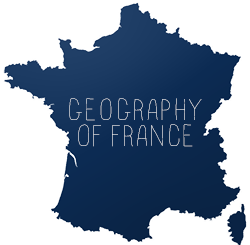 In French, however, subject pronouns are required. Since they are so important, I devote a few days of instruction just to pronouns. 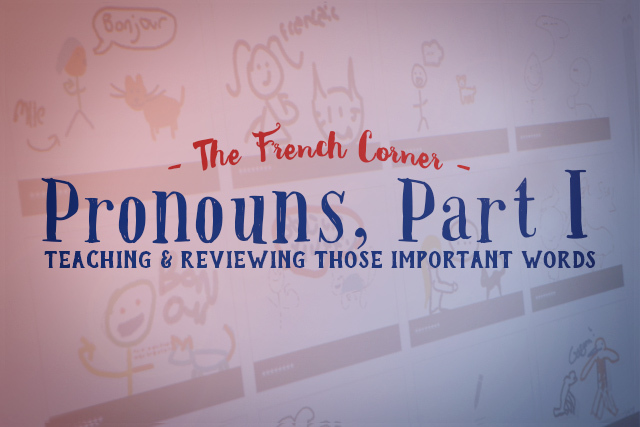 Students have exposure to the pronouns earlier in the year (especially the singular ones), but many students still struggle with them, so before they even work with the various verb forms, I do a little decontextualized review. I know that many teachers are divided on whether this type of material should be taught in context or out of context, but I find that doing both yields good results. While this post will outline ways I practice pronouns in a mostly decontextualized way, in my next post, I will share some ways I focus on particular pronouns in context (once students have had experience producing conjugated verb forms on their own). First, I like to sing a song. We all know that songs help us remember material better. In this song, hand gestures are important. In the below Etienne video, Les pronoms, students must copy the gestures while singing along to the song. It's a little corny, but the melody really sticks, and some of the kids really get into it. 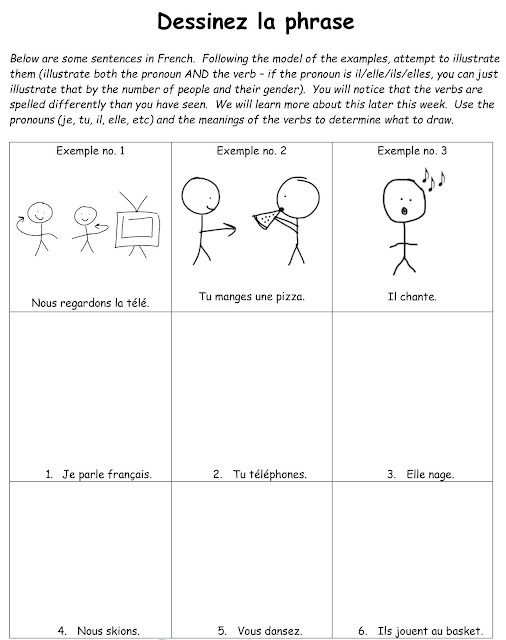 A warm up activity I have students do is to give each student a visual depicting a pronoun (like the ones above) or a pronoun written as a word. Students have to find the corresponding word or image. Since there are many students in the class, there are 30 total cards, and several potential matches for each person. After they learn to draw the pronouns, I have students draw sentences that incorporate the pronouns with verbs. They do not know the verb endings yet when doing these, but they do know what the verbs mean. I call their attention to the different spelling changes, but at this stage it is just input and I am not asking them to produce these sentences. One way I have them do this is with Nearpod, an app that I have previously written about here. On Nearpod, you can assign students to draw something, and collect all their drawings on the board. You could even save the drawings for later. First, they look at a few example slides to see what I am looking for, then they try a few of their own. All the while, I am circulating around the room reminding students to incorporate both the pronoun AND the verb (because once there's a verb, students tend to focus on that more and are more likely to ignore the pronoun). To change things up, I also have them practice this on mini whiteboards. For this exercise, I have the students copy the sentences off the board first to reinforce the spelling (again, they do not know how to conjugate verbs at this point). Below is an example of a homework in the same vein that I give students. Finally, I also do a little review with one of my favorite games, Kahoot. 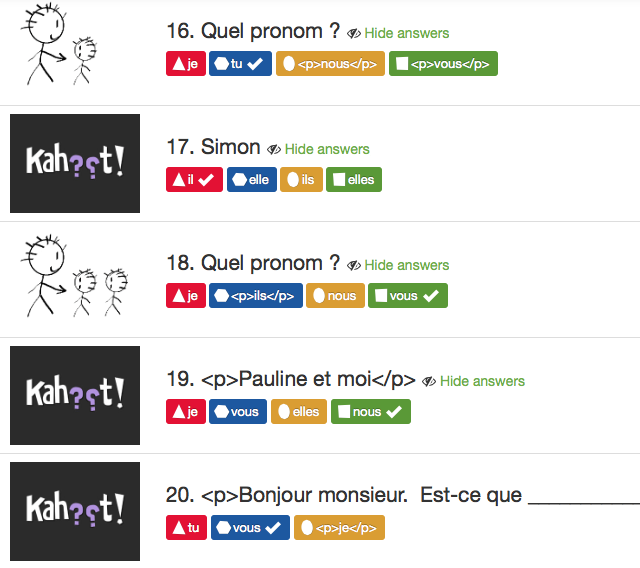 I incorporate a variety of multiple choice questions: students see a visual and select which pronoun it represents, students read a sentence and choose the pronoun that would fit in the blank, students see a name or several names and select TU or VOUS, or students see a name or several names and select either IL/ELLE/ILS/ELLES. 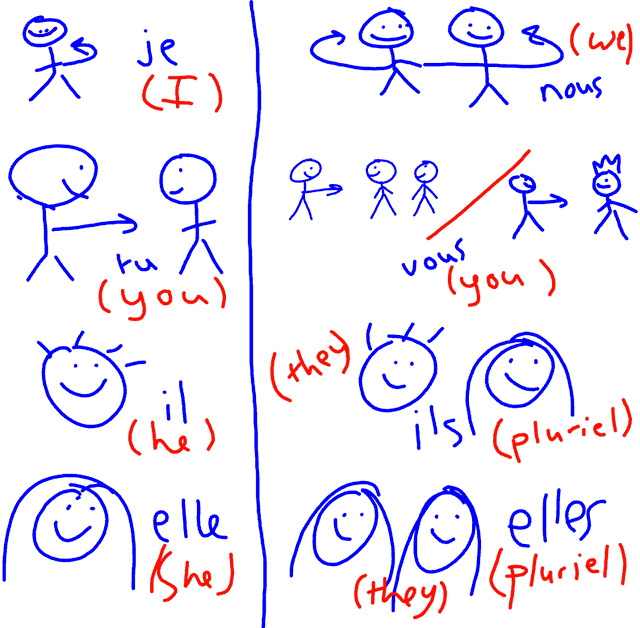 This wraps up how I introduce and review pronouns BEFORE students have experience conjugating verbs. 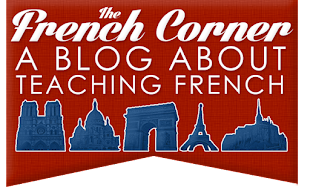 In a follow-up post, I will outline ways I target specific verb forms in various activities that are more contextualized that just reviewing them all at once. How do you teach and reinforce pronouns? Thank you for so many wonderful ideas! I am in my second year of teaching, and am a career changer from a technology field. I have used so many of your ideas in my classes and the kids always love the change of pace. Thank you!! Thank you, Gretchen! I am glad you have found the ideas useful.